Harleston towermill stood on the corner of Candlers Lane, Jay's Green, Harleston. The five storey mill had 3 pairs of French burr stones that were powered by 4 double shuttered patent sails, each with 8 bays of 3 shutters and 1 bay of 4 shutters. The boat shaped cap held an 8 bladed fan. A portable steam engine was supplying auxiliary power to the mill in 1861. William Barber was born in 1779 and died in 1851. His son, Samuel Barber, born in 1811 was also miller in 1839, before moving to Scole_towermill from 1845-1864. 1891-1904 at at Hingham_Deopham_Rd_towermill and Hingham_watermill.
. . . consumption, Mr. E. D. Coote, miller, of Harleston, in his 42nd year. 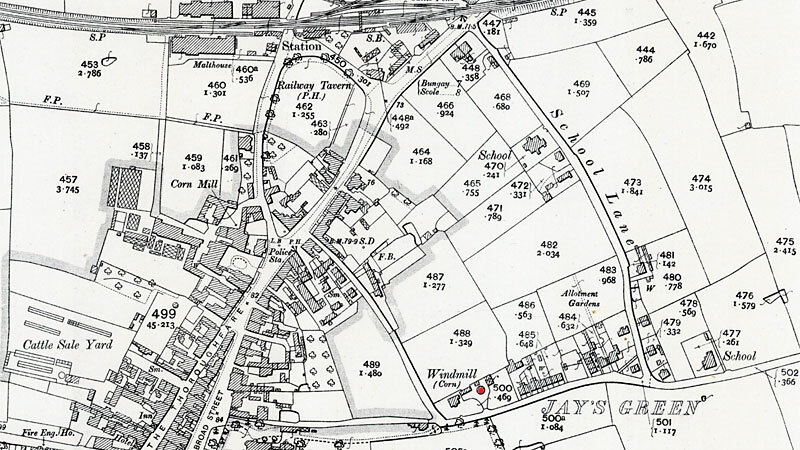 Debenham - On the 8th instant, East Dereham, very suddenly, in the year of her age, Elizabeth, relict of Mr. Thomas Debenham, late of Harleston, in this county. Edwards - On Tuesday last. In the meantime... the morning following the robbery at Mr Cooper's farm, Mr Cooper's bailiff noticed some grains of wheat scattered about....and he discovered a quantity of wheat had been removed... He immediately proceeded to inform his master... and Mr Hudson detailed to Mr Cooper all the circumstances, telling him Mr Knights was acting under the direction of the police and … that the present case was not... clear against Roberts. He... requested that Mr Cooper not take any action … that on the following night there would be an opportunity of capturing many more of the gang. Mr Cooper, however, and police-constable Vincent, of the Suffolk force, proceeded to the residence of Rev. Mr. Colbeck, a magistrate, residing at Fressingfield and obtained warrants... against Roberts... also against Knights, not withstanding what Mr Hudson had said about Knights acting under the direction of the police. Knights and Roberts were apprehended... from statements made by Robert's wife, Meen was also taken into custody. A warrant was also issued for .... Dunn, but Dunn absconded. ...our reporter, who was present at the last hearing only applied for permission to copy the depositions... taken at the first hearing... he stated that it was customary for such permission to be granted, but Mr Lawton, of Eye, the clerk to the justices... stated that during the more than twenty years he had been the magistrates clerk he had never had such an application before.... Mr. Lawton was asked if he could not decide at once, but he replied he must takes some time to think about it, and requested our reporter to leave his address... as no communication... has been received... it is to be presumed that the clerk... declined. What motive Mr Lawton can have... it is difficult to conceive as the circumstances of the case are well known in the locality. We have however, from another source obtained the evidence of the witnesses who were examined in the first hearing and these we now append. Mr Robert Reeder, farm bailiff to the Rev Augustus Cooper, stated that on the morning oft the 3 rd of December ash e was passing out of his master's yard, he noticed some wheat which was spilled near the gate. He went immediately to the barn but as everything appeared all right there, he proceeded to the granary and found some wheat had been taken from a heap. He directly informed Mr cooper, and saw Mr Hudson at that gentleman's residence. He afterwards went to Knight's mill and saw several parcels of wheat, one sample of which he believed to be taken from his master's, It was old wheat. In cross examination Mr Reeder said that when he saw Mr Hudson at Mr Cooper's, Mr Hudson told him that corn had been lost in the neighbourhood and a trap had been laid for the thieves; and Mr Hudson asked Mr Cooper to keep the matter quiet for a few days as he had no doubt the police would find out the parties. Mr Hudson also told Cooper that Knights was acting under the direction of the police and it would be extremely hard if Knights was to be dealt with as a criminal as he was to receive the corn in order that the thieves were to be detected. ...witness said that the sample taken from knights mill was like his master's but he would not swear to it. John Vincent, police-constable at Fressingfield stated that having received information that five or six coombs of wheat had been stolen from Mr Cooper's he proceeded thither. 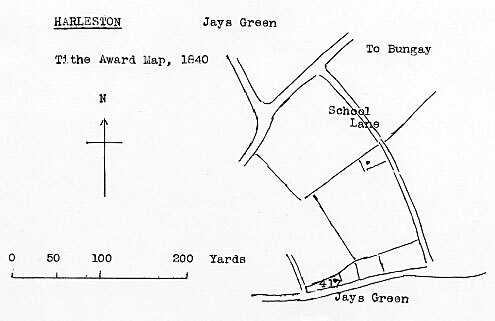 In the yard he observed marks of wheels and these marks he traced in the direction of Harleston. He then went to Knight's mill, where he saw a cart, which he believed was the one he traced as the tire of the wheel was square and quite sharp. He saw Knight who told him he had purchased six coombs of wheat of Roberts... it was in the mill... mixed with other wheat. Knights also told him that he had been with Roberts to the four cross ways; that Roberts took the horse and cart, ad turned down a a lane; that Roberts was gone about half an hour and then came back with six coombs of wheat which he (Knights) took home and mixed. Knights also told him that he had given Roberts £ 6 for the wheat as Roberts had stated that a party was in the town who wanted the money; and that Knights added moreover, that what he had done was by direction of Mr Hudson and Police-constable George. On the following day he (Vincent) apprehended Roberts at Harleston, and told him he was accused of stealing wheat....Police-constable George said to witness “ you had better not interfere with the case as I know all about it ” Vincent here produced a sample of wheat which was taken from Knight's mill. Witness then took Roberts before the rev Mr Colbeck and Roberts admitted that he and Knights went after the wheat and that he (Roberts) took the wheat and carried it back to Knights. Roberts was then left with Sergeant Mayes at the Stradbroke station. When Knights was before Mr Colbeck, he was about to make a statement, when Police-constable George stopped him. In cross examination, Vincent said that Knights had told him that he was acting under the direction of Mr Hudson and Police-constable George to which he (Vincent) replied “ I have nothing to do with their plans as I have not been communicated with ” He arrested Roberts before he saw George. George told him he expected a robbery was to be committed and that Knights was to “ row in ” wit the parties. Mrs George had previously told him that her husband knew all about the matter. Benjamin Green, landlord of the “ Duke William ” public house deposed that Roberts,Meen and Dunn were drinking there in company and that they had some beefsteaks there. George Barber stated - I live at Wingfield and work for Mr Buck. On the afternoon of the Monday before the robbery I met two men - Dun and another whom I did not know... going from the direction of Harleston towards Weybread. Between five and six o'clock I saw (them)... return towards Harleston and I said “ good night ” ... I saw them in Mr Bond's first field... I will swear that Dunn was one but I cannot say that any one of the prisoners was the other man. Police-sergeant Mayes said - I apprehended Meen on the Saturday after the robbery... I have not been able to take (Dunn) into custody as he has absconded. Meen was at home when I apprehended him... I have made enquiries at Harleston and other places with respect to Dunn, but have not been able to ascertain his whereabouts. Police-constable Vincent... wished to make an addition to the evidence … at the first hearing of the case... Since then he recollected that Knights said he had bought seven cooms of wheat of Roberts before... and told Mr Hudson. Mr Fox - How is it then that you recollect it after a lapse of eight days from the first hearing? - I recollected it the same evening. Mr Mosley here remarked that Mr fox was not engaged to prosecute Roberts. Mr Fox said he had not intention of doing so... the plan which had been laid was entirely successful... police-constable Vincent stepped in and spoiled the lot... His client had not been in Harleston many years, but during the time that he had been there he had conducted himself in every way as a respectable and straightforward man should do. Reams more of this but essentially Meens says he knows nothing and is of no involvement at all, Roberts and his counsel are trying to muddy the water by saying that Knights told Roberts what to do not vice versa, Hudson confirmed that Knights came to him to say he had his suspicions and that whilst he (Hudson) had not noticed wheat going missing the bags and wheat produced by Knights matched his property, he (Hudson) had noticed barley going missing and that locks had been tampered with. Both Hudson and PC George re-iterated their involvement and awareness off all Knights had done under their approval to enable the apprehension of the thieves, that although they thought the next robbery would be in Norfolk, Vincent had been made aware of the goings on and had to their minds 'jumped the gun'. Rev. Cooper however back Vincent to the hilt, said Fox was being unfair in claiming Vincent had jumped the gun, and had acted in the best way - on poking the other magistrates all agreed. Conclusion come to was Meen was discharged whilst Knights and Roberts were remanded to Norwich Crown Court with stonking bail at £80!!!!!!! At the Suffolk Quarter sessions held last week at Ipswich, bale Knights and George Roberts were indicted for stealing wheat from the Rev A Cooper art Fressingfield. From the report which we gave of the proceedings before the magistrates at the time of committal, our readers must have been surprized that Knights - whose sole object had evidently been to assist in the discovery of a gang of thieves who were carrying on extensive depredations in the neighborhood - should have been included in the charge. No doubt the Chairman of Quarter sessions, C Austin Esq, also felt that his brother magistrates, in committing Knights, certainly 'committed' themselves. In referring to the case, in his charge to the Grand Jury he said that “it was marked by some singularity in circumstances. Knights was a miller at Harleston, Roberts appears to have stole the wheat and carried it to Knight's mill and the latter was charged as receiver. It would appear that Knights had concerted with one or more of the Norfolk Policeman, to assist in discovering the robbery, and for that purpose he was to pretend that he was an accomplice and the corn was taken to his mill. It was there mixed with some other corn and being of a peculiar quality was easily identifiable by the Suffolk Police, who had no knowledge of this arrangement between the Norfolk police and knights and who accordingly took Knights before the magistrates and knights was committed as a receiver of the corn. If they believed in the existence of such a compact they could not of course find a true bill against Knights. The occurrences in this case had a sort of romantic appearance about them, and the case had an exact parrallel in one which was recorded in law books, where a case was recorded of a man's agreeing to assist in committing a robbery for the sake of the reward. There did not appear to have been any such motive in Mr Knight's share in this transaction, and they could not of course find a true bill against him if they saw any truth in these statements. The grand jury accordingly ignored the bill against Knights. The next morning (Tuesday) Vincent the Fressingfield policeman, instead of keeping the matter quiet went to Harleston....(pc Georges) wife told him he had better not go to Knights until he had seen her husband who already knew all about it. Vincent did not take this advice but went to Knights who told him how matters stood..
Next morning (Wednesday) Vincent came to Harleston again and told pc George he must arrest Knights or Roberts as Rev Colbeck threatened to report him for not taking them into custody. George replied “You surely will not arrest Knights, who has been assisting us to detect these theives” In the mean time Mr Hudson went to the Rev Colbeck's at Fressingfield... explained the case... understand the answer he got was that the Suffolk police had nothing whatever to do with the arrangements of the Norfolk police, that a felony had been committed, and that if Knights had been ill advised by Mr Hudson and the police, he must take the consequence, the police must arrest the parties if they could and had nothing to do with any plans laid by the Norfolk police. It appears to me sir that these magistrates were entirely ignorant....Knights has been most materially injured by the ignorance of these meant he has been put to considerable expense (which I am informed by the public who know the case intend to raise by subscription) and a stigma has been very unjustly cast upon his character, he having merely assisted to detect a gang of thieves who have been carrying on their depredation s for some time past undetected. Had the plan been carried out there is no doubt that the gang would have been broken up. As it stands now, they are all at liberty with little chance of being taken as I should think no person after this would risk the chance of going before the Stradbroke bench by assisting the police. Seems like this really was a local cause celebre! Particularly interesting is the fact that during the magistrates trial at Stradbroke, magistrate Cooper resigned - presumably in disgust - I think it is the Rev Cooper who wrote the letter to the paper which prints on straight on from the court report - including the telling 'Mr Cooper thought so too and it was arranged that his farming bailiff should see Vincent the policeman, and explain the circumstances to him...' Otherwise facts have been reported but where motives are assumed it is made very clear along the lines of 'it appears etc' - this is the only motive reported as fact so guess it was the person who held those feelings who wrote the letter! Police accomplice in case of corn robberies. Charge by Suffolk Police not proceeded with. A Neat Dwelling House & Garden. Capital Brick Tower Windmill with 3 pairs of stones and a Cottage in four tenements, the property of the late Mr. William Barber. Messrs. Carthew & Fox Solrs. To Millers. To be Sold by Auction by John Caley at the Magpie Hotel Harleston on Wednesday 7 August 1861 at 6 o'c in 2 lots. Lot 1. A well-built BRICK TOWER WINDMILL of good elevation with 5 floors & all necessary machinery in first rate working condition driving 3 pairs of stones (to which the present tenant has connected a portable steam engine) most advantageously situated at Harleston very near the Railway Station & now in full trade; a neat slated RESIDENCE, Garden, Retail Shop, Counting house, Stable, Gig house, Workshop, Granary, Pig-styes etc. & 2 small enclosures of old PASTURE LAND all adjoining & now let under a lease which expires at Michaelmas 1862 to Mr. Bale Knights. Apply to Mr. James Muskett, Mr. W. L. Fox, Solr. & of the Auctioneer, all of Harleston. A public sitting for the said Bankrupt to pass his last examination. A Capital BRICK TOWER WINDMILL driving three pairs of French stones with all the requisite machinery & well situated for trade, near the terminus of the Waveney Valley Railway at Harleston. Apply to Mr. Muskett, Harleston. Wanted, a JOURNEYMAN as Second Hand. Apply to H. L. Hudson, Harleston. Wanted, a Journeyman as SECOND HAND. A married man preferred. Adjusting Lot g, 1b. 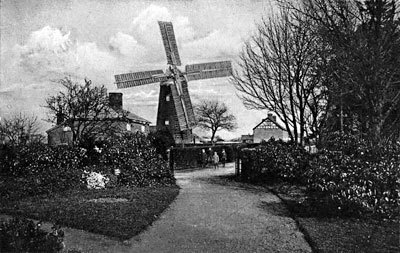 Windmill, JAYS GREEN With spacious Brick, Stone, and Tiled house in the occupation of Mr. Thompson Hudson. Lot Range of Four Boarded and Tiled COTTAGE fronting the Jay's Green Lane. Robert Myhill, who was born in August 1861, was recorded as aged 16 in the 1881 census and he emigrated to Canada in 1888. On 5th January 1974, Gordon F. Williams wrote to Harry Apling to say his maternal grandfather, William Blackwood had worked Jay's Green mill from about 1870 until it was taken down in 1916. William Barber b.1779, my GGG Grandfather was miller at Jay's Green Tower Mill between 1830s - 1851. His son Samuel Barber b.1811 was also at Jay's Green in 1839, then in 1845 - 1864 he was Miller at Scole_towermill. His son William Samuel Barber b.1837 was Miller at the following: 1861 - Eye, 1871 - Gissing, 1881 - Rockland All Saints, 1891 - Hingham_Mill_Corner_towermill and between 1878 -1879 William appears to have been at Carlton_Rode_towermill. William was at Hingham_Mill_Corner_towermill until 1904, his Step-Son Robert John Watling was recorded as miller up to 1908. 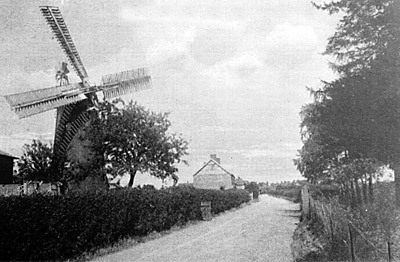 Robert John Watling moved from Hingham_Mill_Corner_towermill to Cringleford_watermill, where he remained until it burnt down in 1916. He was also listed at Saxlingham Thorpe in 1922 and 1925. Samuel Warne (36) b.Harleston, journeyman miller.